What you see above is my favorite album cover. In 2nd place is Steely Dan's Aja cover, which actually serves as my desktop wallpaper because of my minimalist preferences when it comes to the computer screen. A thought just occurred to me - would a true minimalist list the Beatles' White Album as their favorite cover? Going back to the Jackson Browne masterpiece, whenever I tell someone it is my favorite, a puzzled look appears on their face and they ask me why. It's just the entire picture; I love the way that sky looks, and it combines with the trees and the house and the car parked in front to achieve perfection in their synergy. What might seem more puzzling is the memory that comes to mind when I look at the cover. It's of going to eat lunch at Astro Burgers in Inglewood with Amy after the last final of the spring quarter at UCLA. The sky that day looked nothing like the album, nor did anything else, and no song from the album was anywhere to be heard but yet the cover takes me back to that very day. Nothing even exciting happened, either. Well, the hamburger and fries were pretty darn good but that's no reason to remember that particular day more than 30 years later. What triggers the memory to retain some seemingly trivial things? I even thought about that as a little kid. My parents subscribed to Look magazine (as Newsweek is to Time, Look was to Life) and kept a stack of the old issues next to the piano in the living room. One day I decided I was going to remember the particular date that I sat there thumbing through the old issues. I told myself, I am going to remember this date forever, simply because I told myself so. Surprisingly enough, I did remember the date for several years. Even today I remember it was in October although the specific day of the month and even the year are long forgotten. I can still visualize sitting there looking at the magazine and making my resolution, however. As for the Look articles themselves, from all the years my parents had a subscription, there is only one article I can remember. It was about Barney and Betty Hill (not Rubble), who supposedly had been abducted by aliens aboard a UFO. I was fascinated; in fact I just paused writing to go read the Wikipedia article about them and felt a bit eerie that I remembered so many details from the original article in Look. Click on the foregoing link if you want to read about it. I think that's what started up my interest in UFO's which led me to later read several books on the subject, wondering if outer space aliens were in fact real. I'd even search the night sky in hopes of glimpsing one, but no dice for any sightings. That interest continued through junior high but was gone by high school; by then I had other things to think about. These days, while I love a good science fiction movie, I am skeptical of the existence of UFO's. There are too many logistical problems involved with traveling such long distances and to me, I feel the same about interstellar travel as I do time travel - it would be nice to do but it doesn't exist. Let's think about time travel for a moment. Let's suppose time travel was possible and in the future people are able to travel back and forth in time. That would mean they could go back in time, change the events of the past and as a result, alter the future. Just like Marty did in Back to the Future, or like what happened in the Terminator series. But if that's the case, then all someone else would have to do would be to go back in time and make a different change, resulting in a whole different future. Who knows how a seemingly insignificant event can snowball into something of much larger proportions? So imagine a future in which people are constantly traveling back and forth in time, tinkering with the past in order to change the future and perhaps even obliterating themselves in the process because they do something that prevents them from being born. If you believe in destiny, then what exactly is your destiny? Someone from the future would have to come back in time to set that destiny but that destiny could constantly be changing depending on what other people from the future altered. As I sit here and type this weird blog, I am typing on borrowed time because at any moment, a future person could go into the past and do something that results in my being somewhere else right now instead of at my keyboard. All of a sudden, there I am herding cows. My entire consciousness would be altered and I'd have a completely different set of memories. 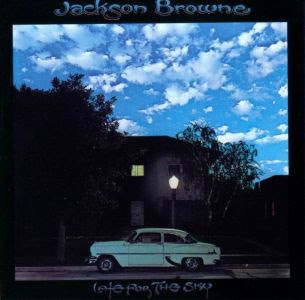 Gee, how did I get from a Jackson Browne album cover to time travel? That was not at all what I was intending to write but once I thought about Look Magazine, I remembered Barney and Betty Hill, which led to telling you about my fixation with UFO's and then time travel. Are you still there? Sorry to twist and turn so much but this is more interesting than what I was going to write about anyway. Now I'm all hot to read that book about those two who say they got abducted, Uninterrupted Journey. I just checked online and it's at the Arcadia library. If I have time tomorrow, I'm heading over there to check it out! I tell you, one thing leads to another with me. Maybe that's why I never seem to have enough time, lol.. I was also originally planning on putting a completely different YouTube video below, but what the heck.. this one fits better.